Throughout, Trump stressed that Puerto Rico's governor had praised the federal response, characterizing Ricardo Rossello as "so thankful of the job we're doing"
Suddenly, just about all President Donald Trump can talk about is Puerto Rico. After not mentioning the hurricane-devastated island for days, Trump on Tuesday pushed back aggressively and repeatedly against criticism that he had failed to quickly grasp the magnitude of Maria's destruction or give the U.S. commonwealth the top-priority treatment he had bestowed on Texas, Louisiana and Florida after previous storms. Trump announced that he would visit Puerto Rico and the U.S. Virgin Islands next week. He tweeted about Puerto Rico's needs. He talked about Puerto Rico during a meeting on tax cuts. He raised the subject at a Rose Garden news conference with the prime minister of Spain. And he attended a hurricane briefing. He called a meeting of agency heads tasked with helping Puerto Rico recover, and sent top officials out to the White House driveway to talk to reporters. FEMA Administrator Brock Long delivered specifics: 16 Navy and Coast Guard ships in the waters around Puerto Rico and 10 more on the way. Throughout, Trump stressed that Puerto Rico's governor had praised the federal response, characterizing Ricardo Rossello as "so thankful of the job we're doing." 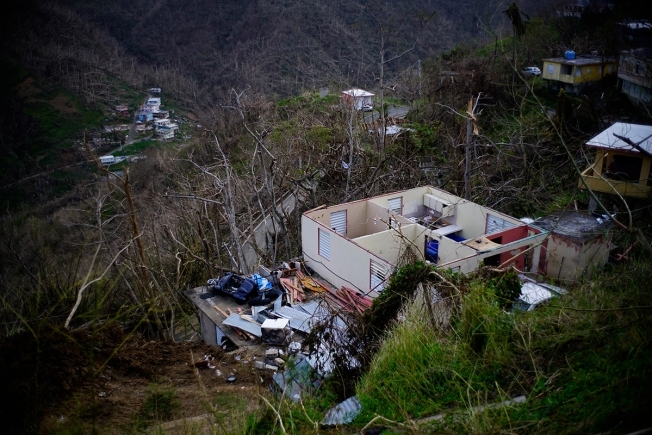 Six days after Maria struck the island, conditions in Puerto Rico remain dire, with 3.4 million people virtually without electrical power and short of food and water. Flights off the island are infrequent, communications are spotty and roads are clogged with debris. Officials said electrical power may not be fully restored for more than a month. Trump, who had proposed visiting Puerto Rico earlier this month, said that next Tuesday was the earliest he could get there without disrupting recovery efforts. His public focus in recent days on other matters, particularly his extended commentary on NFL players who kneel during the National Anthem, generated criticism that he was giving Puerto Rico short shrift after devoting considerable public attention to storm damage in Texas and Florida. Rep. Nydia Velazquez, D-N.Y., said she had been concerned that Trump's continued tweets about NFL players showed he didn't grasp the severity of the crisis. She warned that if he didn't start taking it seriously, "this is going to be your Katrina," referring to criticism of President George W. Bush following the slow federal response to Hurricane Katrina in 2005. And it wasn't just Democrats. "The crisis for these Americans needs more attention — and more urgency from the executive branch," tweeted Republican Sen. Ben Sasse of Nebraska, a frequent Trump critic. Florida GOP Sen. Marco Rubio concurred, tweeting about San Juan, "MUST get power crews in ASAP." "We have a fundamental obligation to Puerto Rico to respond to a hurricane there the way we would anywhere in the country. #HurricaneMaria," Rubio tweeted Tuesday. For any president, there's much to be gained politically from ably handling the government's response to natural disasters, and Trump is no exception. His approval ratings in the most recent Gallup tracking poll ticked up, to 39 percent, after his trips to survey damage from Hurricanes Harvey and Irma in Texas and Florida. But Trump's fixation on Puerto Rico on Tuesday stood in sharp contrast to his focus on other matters between Maria's landfall Sept. 20 and Monday, including his fight with the NFL over football players protesting during the National Anthem. The president has tweeted about the NFL more than two dozen times since Friday. By Monday, Democrats, Republicans and Rossello were emphasizing that Puerto Ricans are Americans, too. Trump was intent on showing he'd gotten the message — but still wasn't ready to set aside the NFL issue entirely. "We are totally focused on that," Trump said Tuesday of the growing crisis on the U.S. island. "But at the same time, it doesn't take me long to put out a wrong and maybe we'll get it right. I think it's a very important thing for the NFL to not allow people to kneel during the playing of our National Anthem." Even as Trump insisted he has plenty of time to prioritize both issues — "All I do is work," he said Tuesday — criticism lingered. Particularly galling to Trump's critics were his first tweets since last Wednesday when he urged people on the island to stay safe as Maria came ashore. In a trio of tweets on Monday night, he suggested that Puerto Rico was suffering in part because it had incurred "billions of dollars" in debt to "Wall Street and the banks which, sadly, must be dealt with." "Texas & Florida are doing great but Puerto Rico, which was already suffering from broken infrastructure & massive debt, is in deep trouble." Still, he promised, "Food, water and medical are top priorities - and doing well." Rep. Joe Crowley, D-N.Y., said it was "absolutely ridiculous" for Trump to mention Puerto Rico's debt "when people are suffering and dying. Here's a president who's used bankruptcy throughout his entire career." Associated Press writers Matthew Daly contributed to this report.